Our Early Ford Broncos combine the nostalgic styling of a by-gone era with the reliability, comfort and attention to detail you demand. Built by hand to drive for decades, each of our classic Ford Broncos has the strength and durability you need to handle whatever you throw at it. Take your next trip to the mountains to new heights. A fresh look for your time out by the fresh water. Turn heads while cruising the beaches and boulevards. Velocity Restorations has spent the past decade perfecting the process of Early Ford Bronco restorations and is now dedicating an entire division devoted to set priced 1966-1977 Bronco builds. Take a tour of our 22,000-square-foot facility and you’ll see the best technicians in the business creating vintage Bronco interiors with modern technology touches, powertrain transplants such as a new Coyote V8 engine upgrade, metalwork, electrical repairs and upgrades, paint and bodywork and much more. All designed with the end goal of transforming tired and rusted Broncos into beautiful, high-performing, award-winning works of art. 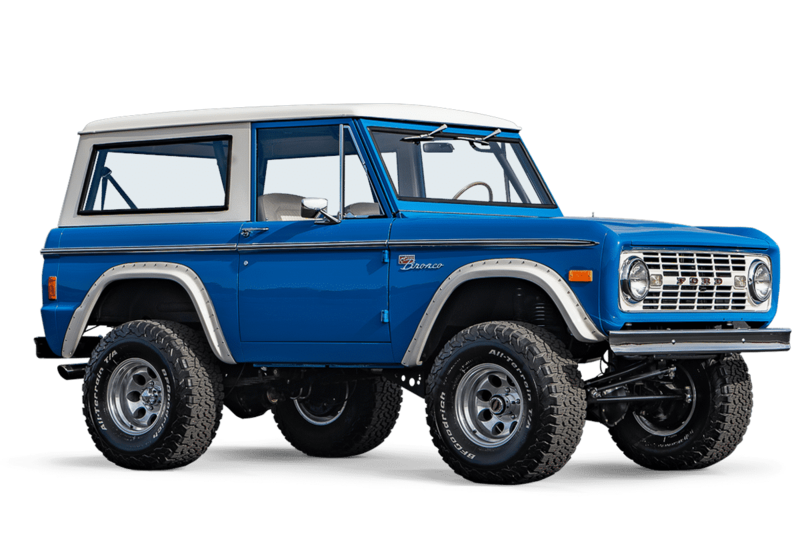 Check out some of our past builds to see the incredible amount of detail and dedication we put into every Early Ford Bronco that rolls out of our shop.